Diary ELDORET TO TIMAU VIA SWEETWATERS GAME RESERVE: (3rd may) Left Eldoret early to head towards Mount Kenya, second highest peak in Africa at 5199 Metres. Stopped off in Nakuru for our second visit to the Happy Cow Cheese Shop to stock up on Edam and Gouda made by Dutch cheesemakers in Kenya. 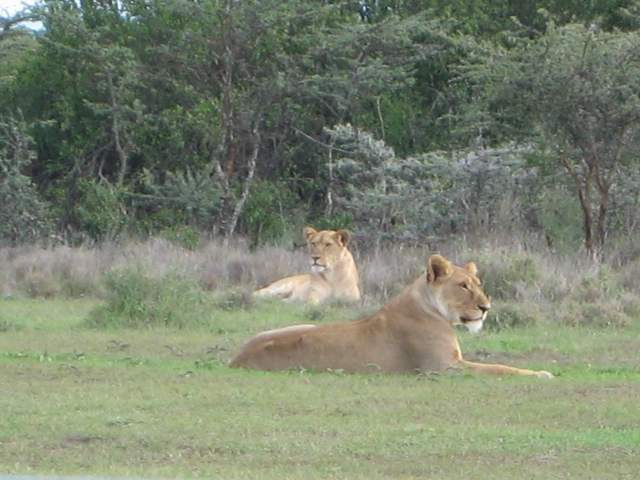 Decided to take a dirt road that passes Sweetwaters game reserve and came across two lionesses sitting by the side of the road (spotted by Polly, who has reminded us that she saw them first 653 times in the last 48 hours) Stopped to have a look and Clare decides she can get a better photograph (our camera only has a 3X zoom) by getting out of the car 30 metres from them. One immediately goes into “attack mode” with rear end up, tail waving, eyeing up this juicy unexpected mid-afternoon snack – “OIY!” I scream at the lioness at the top of my voice and the lioness, suddenly startled, turns tail and flees. “Dad, that lion had an exhaust” observes Nye mistaking the dust for the emissions of a 1 lion power engine. Clare gets back into the car unscathed! Don’t you ever, ever do that again!” I say….” I don’t fancy watching you being eaten in front of the kids”…..”although I might get some small satisfaction if you were eaten in front of me”…. Anyway, it taught me that if confronted by a hunting lion a very loud “OIY!” can be an effective deterrent….try it next time you are at Longleat! Kids spent the rest of the journey speculating what I would tell Granny and Grandpa if Mum had been eaten…”She was quite tasty”…”The lion seemed to enjoy her”….” Dads’ stick wasn’t long enough”….. “She made the lion sick”… were some of the more comforting thoughts.